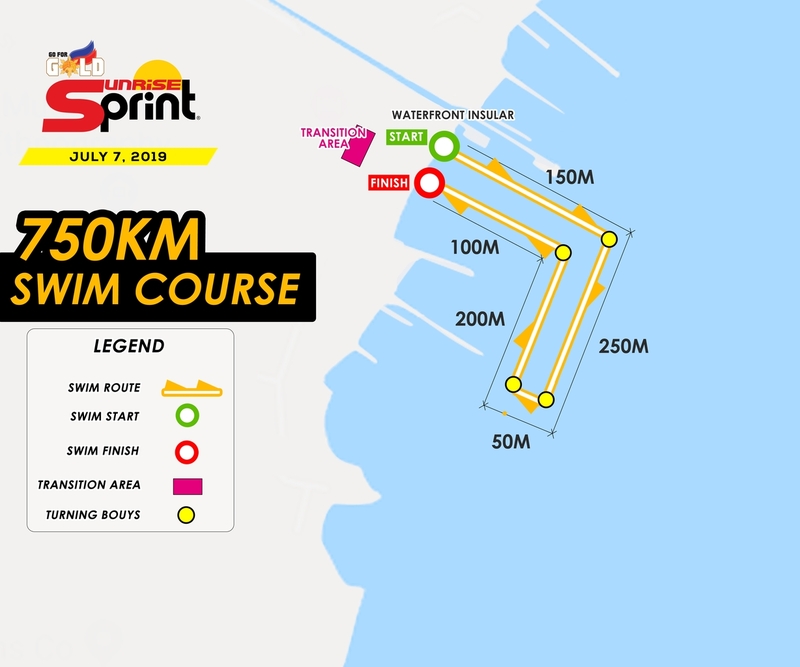 The swim course begins at the Naga City boardwalk, a 750meter rectangular clockwise point to point swim course will end at the transition area in the boardwalk. The 16km bike course will be a two loop course. Participants will exit transition and turn right to Natalio B. Bacalso National Highway and head north they make the first turn around at KM 3.8, and they head down south heading to the second turn around at KM 7.75. They head back to the north turn at KM 11.7 and head back to the south turn around at KM 15.65. After completing 2 loops of the 8km course participant will head to the transition area for the run. 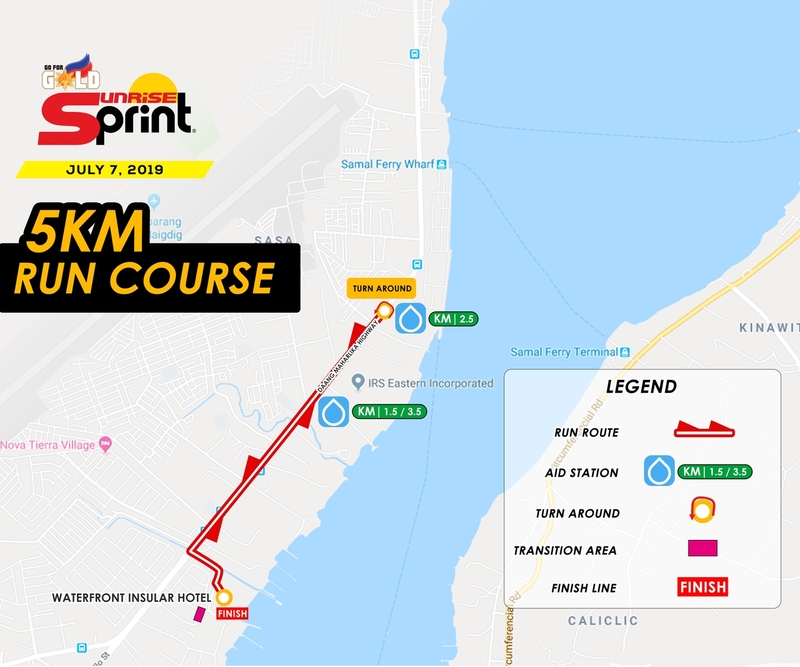 The run course, participants will exit transition and turn left to Natalio B. Bacalso National Highway and head south, making the turn-around at KM 2.5 of the one loop run course. Participants will head back to the sports complex for the finish line. The 750 meter swim starts and ends in the beachfront of Waterfront Insular Hotel. The course will take participants challenge participants in the waters of Pakiputan straight. The swim exits to the hotel garden heading to the hotel parking lot for the bike course. The 20km course, is a single loop flat bike course. Exiting transition participants head towards the main road and turn right heading to Daang Maharlika Highway heading north. 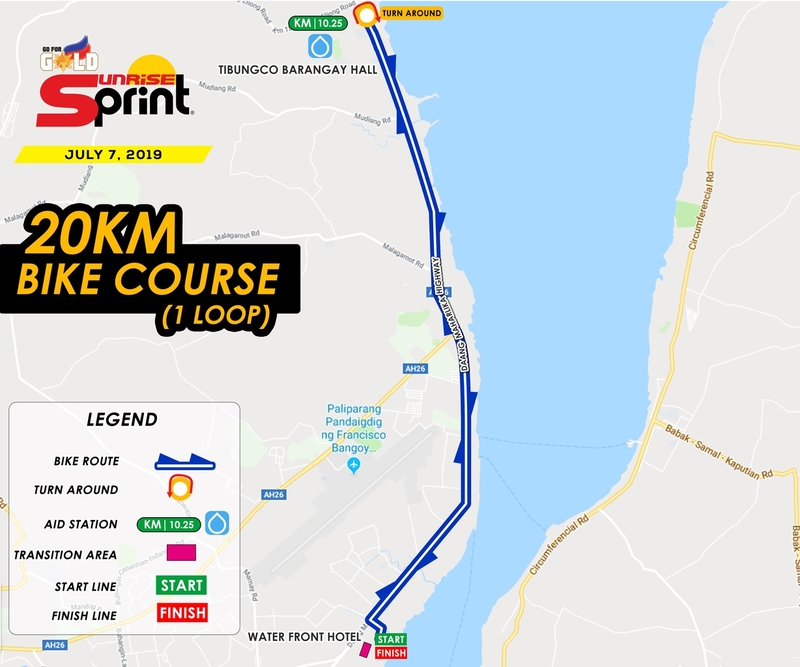 Once they reach the 10km mark at Barangay Tibungco they make a turn-around and head down south and head back to Waterfront Insular Hotel to complete the bike course. The 5 km run course is a flat one loop course. After exiting transition in Waterfront Insular Hotel, participants will turn right using the right side of the Daang Maharlika Highway heading North. Participants will make the turn-around at KM 2.5 and head south, entering the hotel heading to the beach area for the finish line. © 2019 Sunrise Sprint All Rights Reserved.